Piece No 3. of the Parody-Homage Collection. 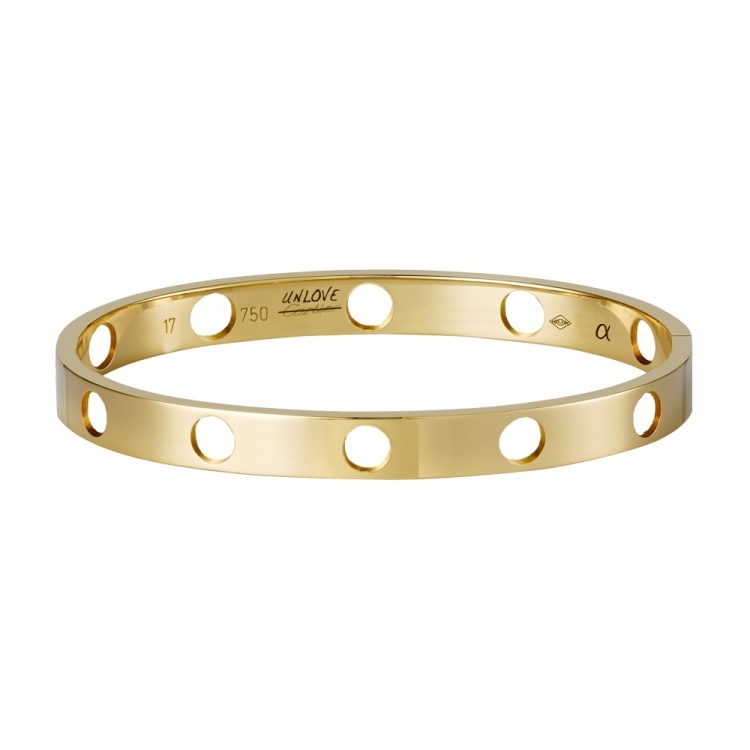 This is a parody-homage of the Cartier LOVE Bracelet. The UNLOVE bracelet is for the light and dark-humored, perfect for celebrating break ups and divorces, or simply independence even whilst in a happy relationship. Unlike other parodies of luxury, I still wanted the piece to be of design value independent of the parodied-homaged. Considered on its, own, I love that the holes are the focal points of the piece--absence is the centerpiece. It also reminds me of the perforated metal strips in children's construction kits, the punched holes on the side of continuous-feed printer that you peel away along dotted lines. Beauty in the mundane. Piece No 2. in the Parody-Homage Collection. 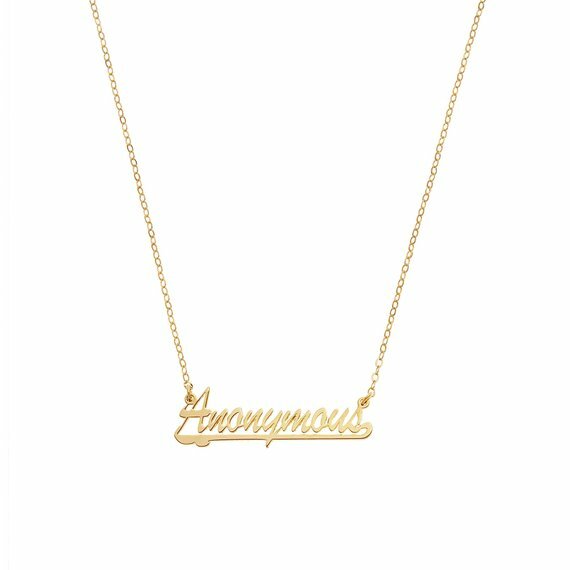 This is a parody of the classic nameplate necklace. The traditional motif of the nameplate necklace, but instead of saying Jessica or Hotstuff, it renders the wearer nameless. A tongue in cheek statement towards the value we put on our names as an integral part of our identity and personality, when the fact of the matter is, we still exist without our labels. Piece No 1. of the Parody-Homage Collection. A parody- homage of/to the classic Return to Tiffany collection, I create my own riff on the iconic heart charm. 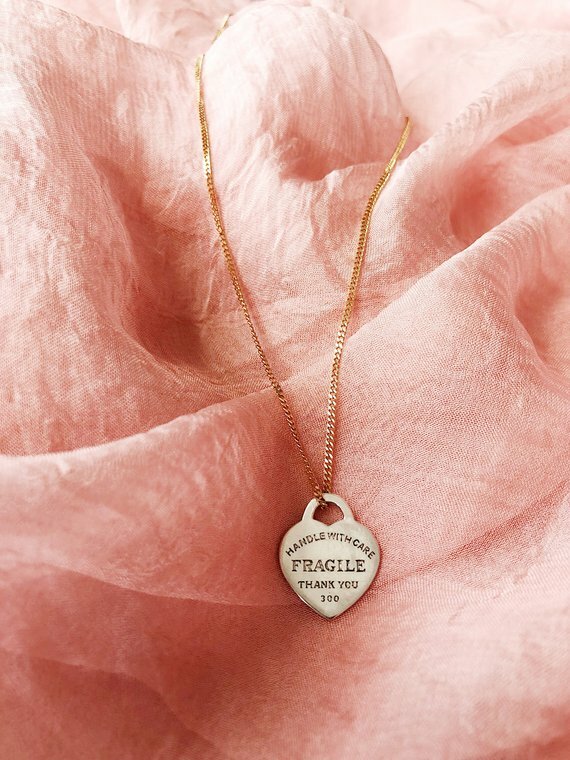 Like the Tiffany collection, The Fragile Handle With Care Charm also de-anthromorphosizes the person by comparing her/him to a precious object. With the phrasing of a fancy luggage tag on fancier cargo. The 'Thank You' replaces' New York' on the original charm and references the hospitality of the plastic bags I'd always see in Asian grocery stores and carrying Chinese takeout. The '300' is in lieu of a metal stamp (usually 925 for sterling silver or 750 for 18K gold). 300 is the average weight of the human heart.